We live in a volatile world haunted by rising religious and secular extremism, proxy wars, geopolitical rivalries, predatory capitalism, and by the chronic deficiency of visionary leaders. This state of extreme uncertainty should compel us to reject any initiative aimed to drastically undermine the current system of multilateral cooperation and international order. Though it still remains controversial, no one can deny that in the past seven decades, the UN has saved many lives through its humanitarian works, its peacekeeping operations as well as its vaccination and education campaigns to save children. That said, in its current form and function, the United Nations is certainly on course to become irrelevant. Times have rapidly been changing and the current model has been static, at best. Over the years, the UN has been described as being the “den of dictatorships” operated by a culture of “numbing bureaucracy” and “institutional cover-ups of corruption.” Worse, the most vital UN organ—the Security Council—has been broadly blamed of being driven by immoral and “undemocratic politics” that approves certain wars in order to stop tyranny or restore peace and for being a bystander through genocide. The Tutsis of Rwanda and the on-going genocide of the Rohingyas of Myanmar come to mind. In the past three decades, reforming the UN has been a reoccurring theme. A number of recommendations and comprehensive reports were authored to suggest reforming one organ or another, but only one had offered an alternative means of funding it. This is perhaps the most crucial of all reform proposals, though at this critical juncture, total transformation is the only way to salvage this great institution. No other country epitomizes the dark side of the UN better than my own—Somalia. Since the early 90s, over $50 billion was spent on Somalia and there is virtually nothing to show for it. Most of these monies were spent in Nairobi, Kenya—the international NGO hub of squanderance—where projects are subcontracted to their bones before the local scavengers are let loose. Over three years later, not a single positive step toward peace and reconciliation was taken. The only thing that UNSOM facilitated was the unsustainable clan-based federalism that rendered Somalia into a half a dozen political fiefdoms in perpetual enmity. They have no shared national vision. And each has its own president who is free to make his own foreign, defense, and economic policies and sell out the nation’s future. The UN endorsed ‘federal constitution’ remains written on an Etch A Sketch. Meanwhile, Somalia remains a nation under de facto and indefinite trusteeship, while those who are mandated to facilitate good governance continue to advance their own zero-sum interests. Though then SRSG (Sir) Nicholas Kay told Chatham House “as the constitution is pending, it is very risky to make any decisions with regards to natural resources,” his office is considered as one of the key facilitators of the most exploitative natural resource deal in the 21st century- the Soma Oil and Gas. Ironically, in the coming months, this same special interest project is likely to be politically reinforced and its mandate expanded with new UN resolution(s). 1992—while the Bosnia genocide and Somalia civil-war were in full force —in an historic meeting that brought together the heads-of-state of its members, the Security Council assigned the then Secretary-General Boutros Boutros-Ghali to conduct a thorough analysis and offer policy recommendations to strengthen UN peacemaking and peace-keeping. As an independent-minded Egyptian academician, veteran diplomat and international relations strategist, Boutros-Ghali has authored a report famously known as An Agenda for Peace. In that report he outlined practical ways that the UN could respond to post- Cold War conflicts. Though in the diplomatic circles and academia, Boutros-Ghali’s introduction of the concept “post-conflict peacebuilding” is recognized as his most prominent contribution, his independent funding recommendation was what made the report so revolutionary and indeed controversial. His recommendation would’ve bypassed any funding manipulation to ensure subjective outcome by any of the major state funders. UN funding would’ve been generated through nominal taxation on international travels, arms trade, and foreign currency transactions. This would’ve leveled the playing field and rendered all member states as stakeholders and as tax-paying equals. While some cheered his bold recommendation, it was met with antagonistic opposition from mainly the US Congress. “It will be a cold day in hell before we allow the United Nations to directly tax American citizens,” said Marc Thiessen who was the spokesman for the Chairman of the Senate Foreign Relations Committee, the late rightwing Republican Senator Jesse Helms. Many bi-partisan politicians were of the view that UN independent funding would undermine the US unipolar status to intervene or wage a war against any nation that is not abiding by the “new world order” or acting in accordance with the geopolitical objectives of Pax-Americana. So, in 1996 the US has blocked Boutros-Ghali’s nomination for a second five-year term, making him the only UN Secretary-General not elected to a second term. A decade later, in the thick of the US global war on terrorism, the neocons who were then leading the US foreign policy placed John Bolton in the UN to employ his infamous mad-man diplomacy. 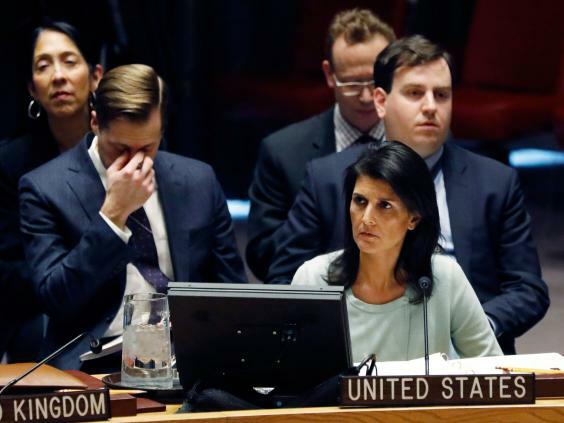 She asserted her willingness to use the 22% of the UN annual budget that US contributes as political leverage. “Are we getting what we pay for?” she asked. 2017 is here. BRICS nations (Brazil, Russia, India, China and South Africa) are strategically and financially set to take their alternative international development institution to the next level to challenge the World Bank and the IMF, dominated by U.S. and Europe. Already BRICS has established the New Development Bank with starting fund of $50 billion and projected lending of $2.5 billion in 2017. BRICS along with Turkey and Iran are committed to make trade with their own currencies. Whenever American companies and consumers want to purchase goods and services from China or India, for example, they would not be able to purchase in the U.S. dollar. Those transactions would have to be made in the Chinese or Indian currencies, and, in due course, BRICS’ new currency. This currency war and subsequent financial tsunami will not only devastate the global economies, its ripple effects are likely to shake the foundation of the UN, especially its most crucial and powerful organ. After all, one of the UN’s global roles is to facilitate, and when necessary pave the ground, for the International Monetary Fund and the World Bank, though each is governed independent of the other. While conflicts and wars are dangerous for civilians, they are lucrative for the arms dealers and are open windows of exploitation for politicians. Ironically, the 5 permanent members of the Security Council happen to be some of the biggest international arms dealers. Is Guterres the Man of the Moment? António Guterres, assumes his post as the ninth Secretary-General of the United Nations at a time of great uncertainties. He certainly comes with valuable experience, especially in dealing with challenges related to settling refugees. But he must also deal with epical catastrophes in the Middle East, active ethnic-cleansing of the Rohingya in Myanmar, Israel’s belligerent defiance, Trump world view, and the diminishing credibility of the UN among other issues. Considering the enormity, geographical vastness, and complexities of the raging conflicts and humanitarian disasters in this century, Secretary-General Guterres must not leave any stone unturned in order to institute necessary changes to meet today’s challenges and prevent the coming ones. Institutional Identity: Today, the world is more interconnected and political consciousness is much more spread out than ever before. The international political soul is yearning for change that is appropriate for the dangerous challenges facing the world. Against that backdrop, the Union of Conscious Nations might be more appropriate than the name at hand. Security Council: If the Security Council must remain symbolically inclusive and substantively exclusive, then the number of the permanent members of Security Council should be increase to 10 nations. Countries such as India, Germany, Brazil, Japan and Turkey should be added in order to reboot the system and rest the dynamics of global influence. UN Funding: Adopt the late Boutros Boutros-Ghali’s aforementioned funding initiative. Also, the Security Council must create an Independent International Commission for Audit. This office should institute policies to improve the fiduciary ethics and responsibility of every organ of the UN. This office should send experts to various localities where UN projects are being implemented. The Secretariat: This organ should be stripped of the authority to bypass the collective will of the permanent missions or the General Assembly. In all political, social,and economic fronts, the world has been changing so rapidly thta it is becoming extremely difficult to keep up with. Across the globe, storms of uncertainty, fear, and hate are throwing societies off balance and turning people against one another. Against that backdrop, US has elected Donald J. Trump as Commander-In-Chief of the mightiest military in the world. Make no mistake; his election comes with “far-reaching geopolitical implications for the future.” The status quo is both unsustainable and risky. ** This was first published by Diplomatist Magazine.